Items 246- out of displayed. EURUSD has extended gains in the last few weeks back above 1.3800 and now also to 1.3900 where market may complete a huge ending diagonal pattern. 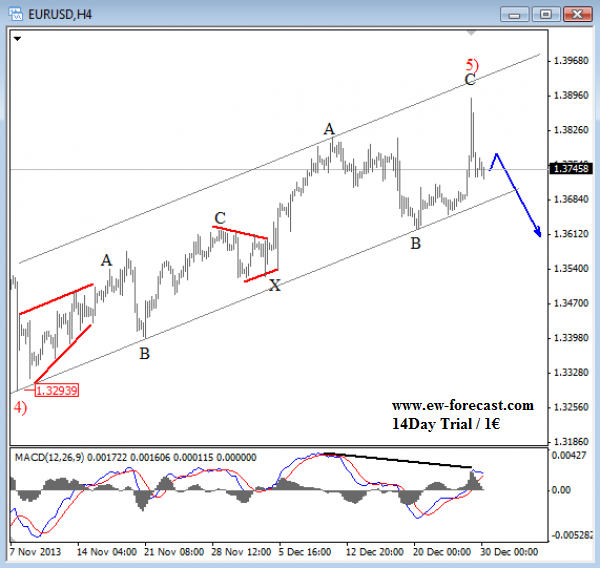 The ending diagonal is a reversal pattern which means that EURUSD could fall sharply in start of 2014. On the 4h chart we can see a recent spike to 1.3900 which made move from 1.3290 more extended and complex. Notice that we labeled rally in wave 5) as a double zigzag because of the overlapping price action. Keep in mind that we are tracking an ending diagonal on a daily chart as mentioned about where each leg has a corrective structure. So if our count is correct then bearish turning point could be near especially if we consider a 150 pip pullback from latest high. We suspect that pair will continue lower, but we would love to see broken channel support line as well as wave B swing low to confirm a change in trend. We can also see a bearish divergence on the MACD that is calling for a turning point. The USD has moved higher yesterday after the tapering from the Fed. However, the buck did not move so much against commodity currencies. 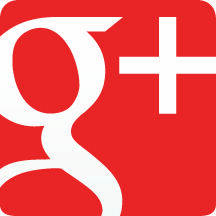 The best reaction was seen against the EUR, CHF and especially JPY because of rising stock market. On the daily chart below of USD Index we can see a strong upward reaction which looks like a start of a wave (C) up to 82.00 area. 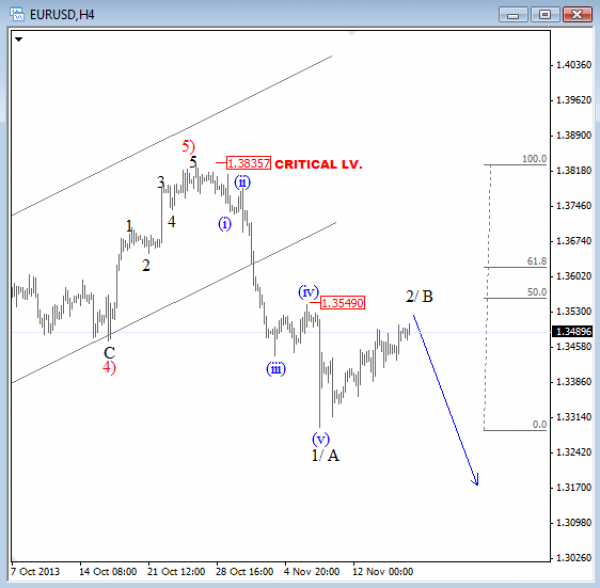 If that is the case then EURUSD should remain under pressure. So with USD Index bullish view our primary count for EURUSD is bearish. We are looking at completed wave (v) at 1.3810 because of an impulsive fall, but before we may look for more weakness we have to wait on a three wave rally back to 1.3720/50 resistance area. If personality of a pullback will be corrective then we will be considering short entries. 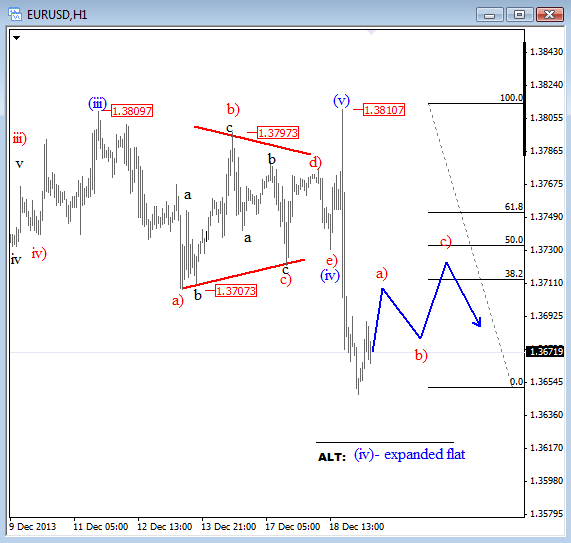 EURUSD is making a nice and slow retracement from 1.3293 low which we think it's a corrective pullback, labeled as wave 2/B. That's still only second leg counted from 1.3835 high but minimum structures are made in three legs, therefore we believe that EURUSD will turn south for a third leg of decline. Resumption of a downtrend could start soon if we consider that price has already retraced back to the area of a previous fourth wave where usually turning point occurs. 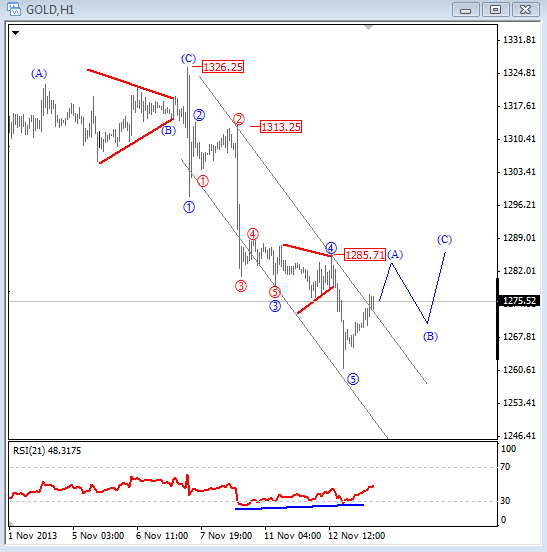 On GOLD we see five waves down with a bullish divergence between waves three and five as shown on the RSI. This usually confirms the idea of a coming reversal in price. In fact, current bounce from the low is now already above the upper trendline of a downward channel so we suspect that market is forming a rally that should unfold in minimum three legs back to 1285. With that said, we do not expect any intimidate reaction lower, even if larger trend is still down! If you want to get short, then we suggest to wait on pullbacks. 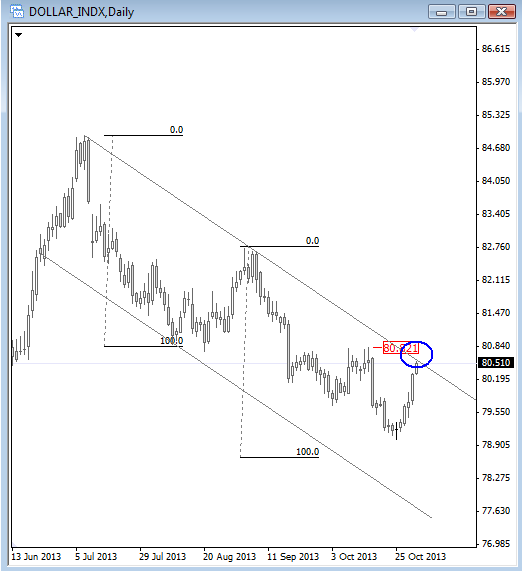 USDCHF extended its gains in the last week, through 0.9044 swing and more importantly, it moved out of a recent upward channel. This breakout (blue circle) usually occurs in the middle of a wave three of a five wave rally, so if we respect the price action then pair is now forming an important bullish reversal from October lows. 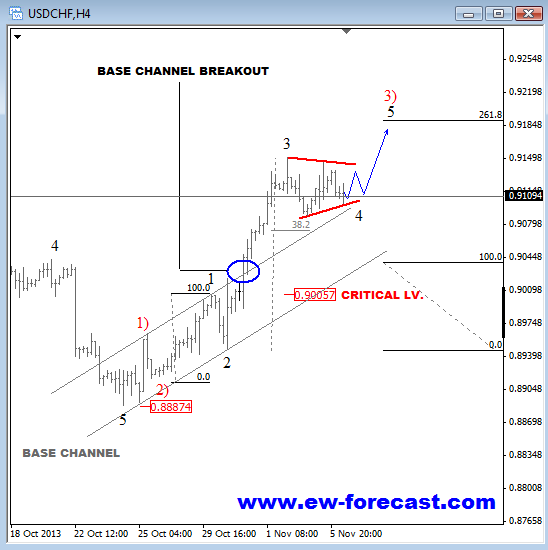 With that said, USDCHF is expected to stay in bullish mode, so current slow and sideways price action above 0.9090 is wave 4 of 3) which means that price is expected to rise up in wave 5 of 3) towards 0.9180-0.9190. This bullish outlook remains valid as long as price trades above 0.9000 swing high because wave 4 must not move into the zone of wave 1, otherwise wave count will become invalid. 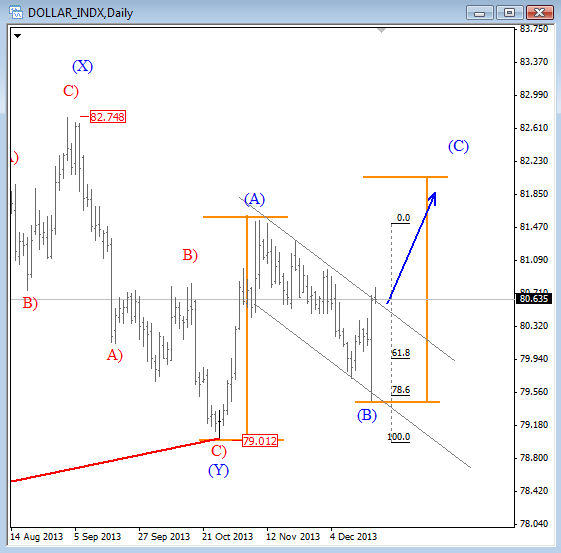 USD Index; New Trend change? US index made a strong reversal from the low in this week and now testing an important resistance line of a trading channel connected from July high. A break of that trendline and close on daily or even better on weekly basis above 80.82 swing will be an important evidence for a trend change on USD Index. 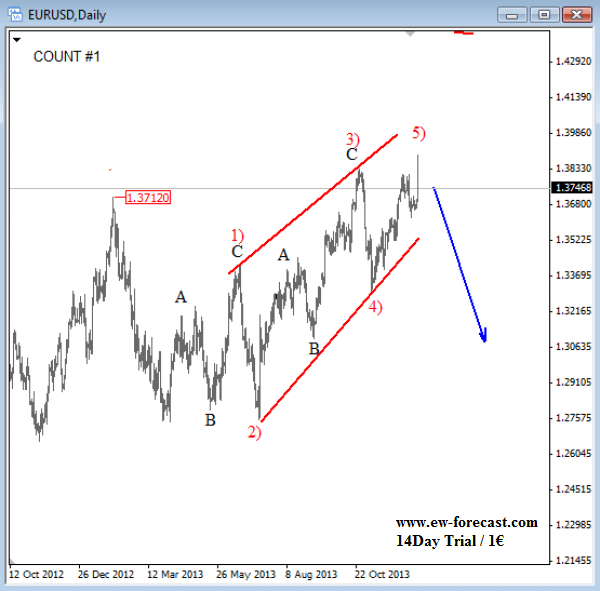 In such case traders should be aware of weaker EURUSD. US Treasury notes and bonds turned bearish yesterday after FOMC statement which was just a trigger for a reversal that has been expected already earlier. 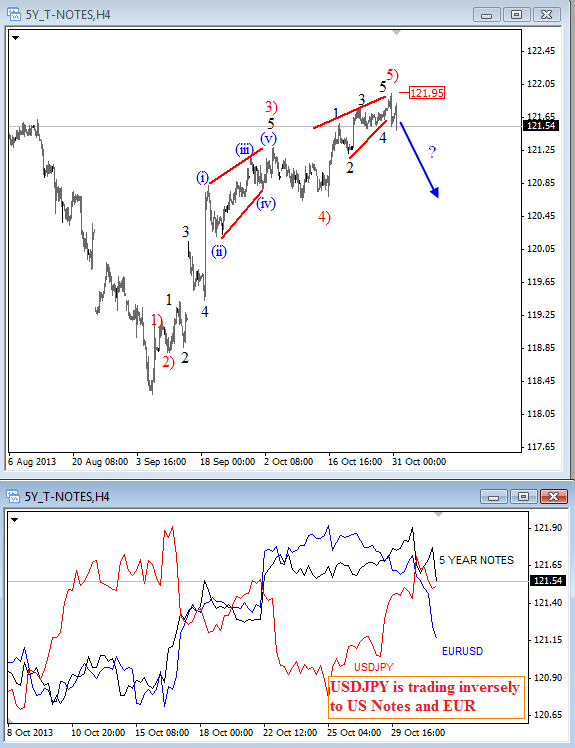 Notice that from September low, rally on 5 Year notes can be counted in five waves with wedge at the top of the current rally which is a reversal sign. Traders with Elliott Wave approach will also know that after every five waves correction follows back to the area of the former wave 4). If we are correct then US bonds and notes will move lower in the next days, but the question is how it will impact the FX market? Well, we see a positive correlation between the EUR and US notes so if the US notes will fall then the EURUSD will probably follow. At the same time we can see a negative correlation between US notes and USDJPY; that’s because rising US yields.